Home is where the heart is. Home sweet home. Home is where you hang your hat. Home may be where one is born and raised. Home may be a new location every few years. There are so many phrases to describe what one thinks of as home. When you really think about it, Home means something different to everyone. Home to me is a place where I feel comfortable. Where I enjoy life, make friends and find new adventures. Currently Italy is my home. Yet I play a little game on a daily basis I like to call…How is the weather in Saskatoon? 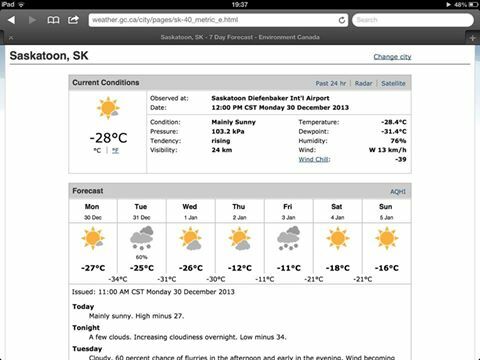 Well this is not the worst I have seen lately but this is the current weather in Saskatoon…BRRR!! I am often asked where I am from; when I respond with Canada, Saskatoon Saskatchewan the next question is of course…How cold does it get there?? So I describe winter in Saskatoon, the average highs and lows and windchill. It is usually the numbers associated with windchill that result in a blank stare while this these numbers are translating in their minds…I smile, laugh and say Si si, meno quaranta, meno cinquanta! Then the fun questions begin such as…And you live there?? Why do people choose to live there?? How do you survive?? Can you even go outside?? So I begin to explain life in Saskatchewan. Another fun game with the pronunciation of Saskatoon Saskatchewan. What language do those words come from? I must admit, I have gone to the Google to ensure I present facts. The fun really begins for me when I am asked about the wild animals we have in Canada. There have been many conversations about beavers, deer, elk, badgers and all types of bears. Giant squirrels…I explain what gophers are and the different types of squirrels. I enjoyed the question about cats that eat children in Manitoba and hopefully diffused that myth. Since I have been to Nunavut I have talked about caribou, muskox and wolves. The most fun was the talking about moose. Particularly since there had been a moose near my neighborhood in Saskatoon once upon a time. The visualization of this poor moose lost in the city resulted in many laughs, Moose and the City. ha ha! Ah Home! I am proud of where I am from and more than happy to share stories of insanely cold temperatures, wild animals and of course the beauty of Canada. My favorite description of all is: Saskatchewan is so flat that we can see our dogs run away for days. 😉 Home.